The Life Of Faith: Introducing July's featured sponsor! A big thank you to her for sponsoring me this month! That being said, here is a little info about Miss Bea and her Learn to Swim with Miss Bea DVD! Have you as a parent, sister, aunt, or grandparent ever wondered how to teach your child how to swim? Do you have questions like, How do I prepare my child for the water? When should I start taking them to the pool? How soon should they start swimming lessons? How do I know when my child is ready? Miss Bea has been teaching swimming since 1971 and has had years of experience teaching babies, toddlers, and countless children how to swim. Because she felt there were no good guidelines out there to teach babies and toddlers to swim, she developed her own and put them together in an easy to use DVD. She believes that YOU as your child's parent are the best one to prepare your child for the water and to teach them swimming, not only for their own benefit, but also for their safety! Here is Miss Bea, a proud grandmother of 5, teaching one of her grandbabies to swim. 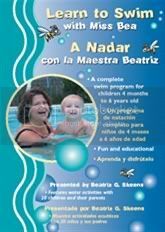 Learn to Swim with Miss Bea focuses on teaching babies through 4 years old how to swim and be comfortable in the water. Because many working parents don't have time for swimming lessons, but want to take their kids to the pool, this DVD gives parents games and activities to play with their kids and teach them how to swim. When parents work with their children before swimming lessons, the children will overcome fears, gain confidence and learn the motions necessary for efficient swimming. Here is a sneak peek into the DVD to see just what techniques your child will be learning and watch examples of other children and parents who have mastered them! While there are many who argue against teaching your child to swim at such a young age, it is through lessons such as these that your child could be saved from a drowning situation. There is no guarantee that a drowning situation can be avoided 100%, but teaching a child how to be comfortable in the water and how to react to an emergency situation can help to reduce water related injuries and death. The National Safe Kids Campaign states: The majority of children who survive (92 percent) are discovered within two minutes following submersion, and most children who die (86 percent) are found after 10 minutes. Nearly all who require cardiopulmonary resuscitation (CPR) die or are left with severe brain injury. Miss Bea feels strongly that by following her teaching strategies, parents will have the 2 minutes necessary to save their child from brain injury if he falls in the water. Cindy Lane highly acclaims the DVD without reservation saying, "I highly recommend this swim lesson DVD. I have four daughters and they have all taken lessons with Miss Bea. Their progress after each lesson was amazing. I never thought they could learn so much at such a young age. Since we are surrounded by water where we live, it was of utmost importance that my girls learn survival skills as well as find enjoyment in the water." There are so many techniques that Miss Bea walks you through step by step on her DVD. Parents and swimming instructors alike can discover that learning together the fundamentals of swimming will become an enjoyable experience as the children master the skills of kicking, digging, going under the water, floating, turning to the wall, kicking on the back, doing the flip float, doing the rocket, and swimming alone! Miss Bea would love to join you and your child today in your swimming adventures. You can purchase her DVD by clicking here. And you are just in time for her summer special, so don't put it off! Want to win a FREE copy of Miss Bea's DVD? Click here to enter the giveaway! Like her on Facebook: Swim With Miss Bea Facebook. And if you would like to get to know Miss Bea and what she is all about, she has invited you to visit her retirement blog Filled With Retirement or visit her personal facebook page at Bea Skeens! Thank you, Faith. I hope that many parents are touched by your words and work with their children to teach them to swim! I can't wait for you to use my techniques on your new little one, from her first bath! !